THE BIG YEAR is a charming, gentle comedy about the importance of family and following your dreams. 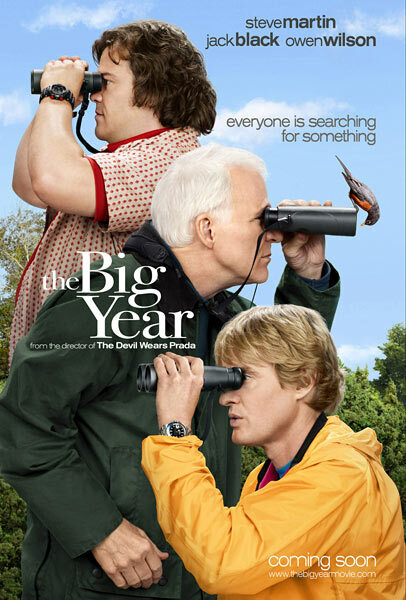 Jack Black stars as a guy in a dead-end job who has a passion for bird-watching, and defies his father's incredulity to do "the big year" - a challenge in which US birdwatchers compete to see the most species. He's competing against Steve Martin's successful executive, who's about to retire and spend time with his loving family. And both the Steve Martin and Jack Black character strike up a friendship in opposition to their common enemy - Owen Wilson's slick, hyper-competitive, incumbent title-holder - a man who has sacrificed his marriage to his obsession. There are no big revelations in terms of the performance. Jack Black plays his typical loveable loser character. Steve Martin plays his typical loveable cool dad character. Owen Wilson plays his typical loveable rogue. The direction (David Frankel - MARLEY & ME) is workmanlike and the script (Howard Franklin - ANTITRUST) is efficient. But the movie had a genuinely warm tone to it, it successfully conveyed the madness and the beauty of birdwatching, against all odds, and I had a good time with it. THE BIG YEAR was released in Canada, the US, Ireland and the UK in 2011 and earlier this year in Malta, Australia, Portugal, Lithuania and Romania. It opens in Germany on June 14th and in France on September 19th. It is available to rent and own.